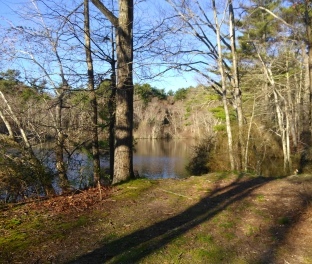 The hiking trails in Plymouth of the Russell and Sawmill Pond Conservation Area derive their name from the two ponds the trails skirt around. This seems confusing as other areas near this conservation area have the same names as these. A state brochure helped to clear up the distinction. 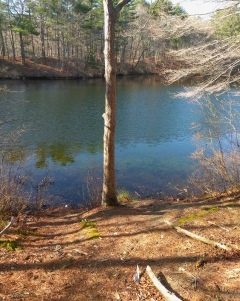 These two ponds are artificially made, originally by the Plymouth Cordage Co. now known as Cordage Park located not far on route 3A. 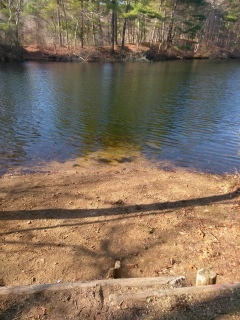 The first pond which is also called Stone Pond on Google maps is Sawmill Pond. The latter is Russell Pond. 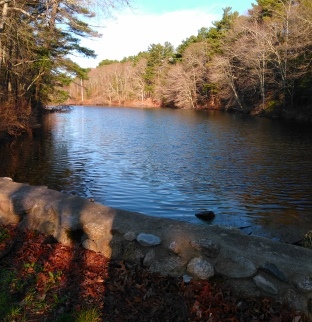 The addition of an "s" which I did not include is probably what distinguishes it from the other area called Russell Mill Pond located further south in Plymouth. 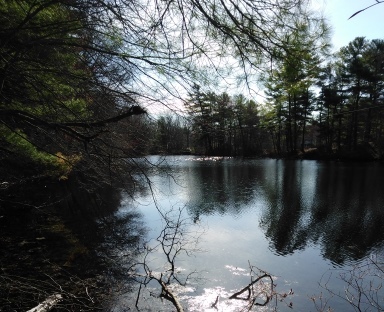 Both ponds are approximately 4 acre shallow ponds that are stocked each year with Trout. Other fish that have been found to be in these ponds are, Sunfish, Golden Shiners, American Eel, Chain Pickerel and Large Mouth Bass. Making this a popular place for fishing. parking area can be a bit rough. There is plenty of parking in the area near both ponds. 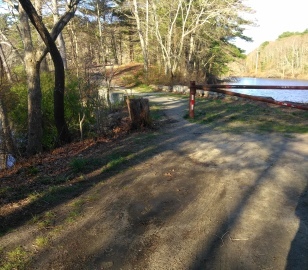 The start of the hiking trail is at the gate where the trail cuts across a narrow inlet between the two ponds. There is also a wooden retaining wall and a narrow trail to the right of the gate. 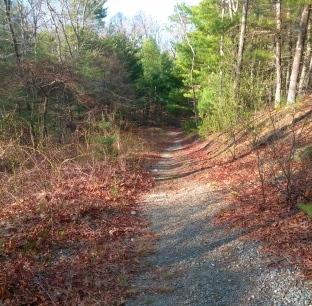 The main hiking trail through the area is a loop that will let out on this narrow trail to the right. way starts as a wide gravel cart path. It soon climbs gently on a raised causeway through a pine forest. It will make a series of climbs. The first gentle and easy, the second is longer and more moderate and the trail slightly tilts. The third climb is short but almost steep. At .07 it crests the hill. There are narrow trails that lead out both ways here. To the left, like many conservation areas, an abandoned tent. To the right the narrow trail leads closer to the pond. Continuing on the main hiking trail, at .31 the trail begins some winding and runs slightly downhill. At this point I startled a deer. runoff leads to the right. 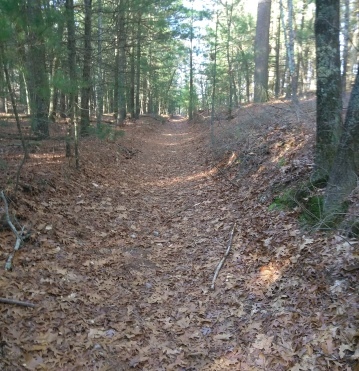 trail leading away to the right. It starts to wind and then the gravel stops. There had been a previous sign that directed you to the right that was missing at my visit this time. 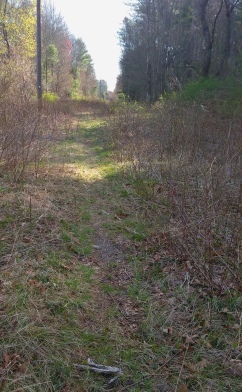 If you follow straight, the trail will turn into a narrow grass filled trail that eventually leads to private property. Going to the right at the gravel end, the hiking trail becomes narrow and leads uphill moderately. The trail will become steep and a faint trail leads left, our way continues straight. 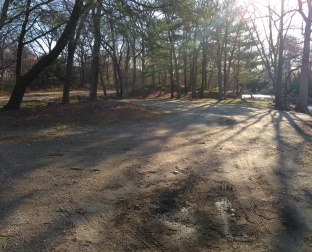 It soon connects with an older cart path. 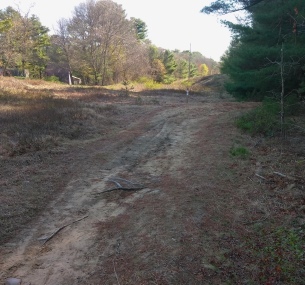 Going left will lead off the conservation area to private land, right is the way of the conservation trail. 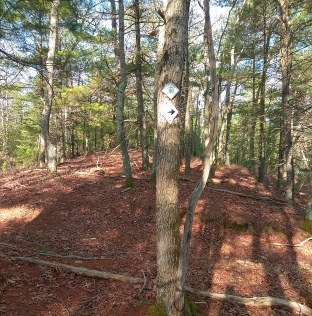 The trail now leads on a gentle downhill track and leads to signage. 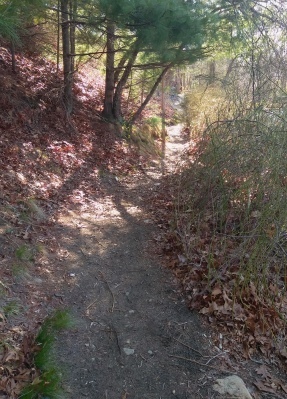 Going right will make a smaller loop and lead back to the original gravel trail followed in. Going left here to continue the full loop. The trail now climbs gently uphill on a small boulder strewn trail, the forest is open and pleasant, but obvious night time visitor activity is apparent. Heading further into the forest on a wide cart path through open forest. Soon the trail comes to an intersection with a trail leading out to a power line. This can be taken to shorten the route if desired. Heading left will bring you back further into the forest on another cart path. A large tree lays across the trail and at .95 the trail now leads slightly uphill and towards route 3. As you approach the visible traffic, a trail leads right out into the same power line as at the previous intersection. 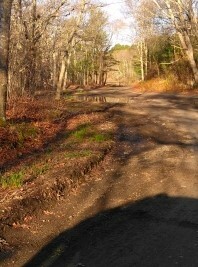 At 1.05 this starts as a moderate uphill climb, crests and then leads downhill on truck grooved dirt and gravel track. Evidence of bicycle usage here. The ground starts hard packed but becomes soft sand in areas. There will be another soft uphill jog then a moderate downhill track. The truck tracks will head to the left and the conservation trail will head straight narrow and downhill. At 1.27 it connects with the first intersecting trail that leads out to this power line. If you don't like hiking along a power line you can re-enter the forest. Also good for avoiding the steep section of this trail. 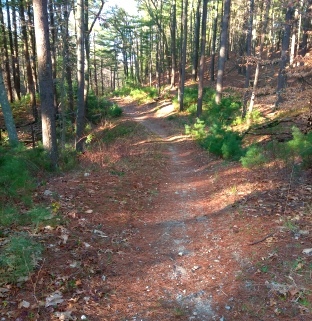 The trail continues narrow on a grass and pine needle mix and runs along the forest edge. It will climb once again, then runs downhill steep and rough. On this section it is best that bicycles are on the left and hikers on the right. will continue narrow through a briar patch. At 1.46 a blue dot trail will lead off to the right. Continuing straight, at 1.56 the trail reaches the far end of Russell Pond. 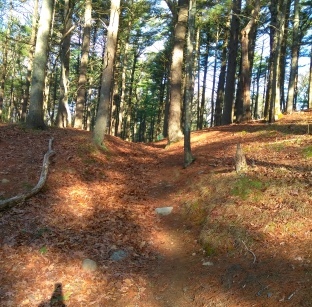 above while running midway along a hill. paths leading to the waters edge. In some areas it appears there were small beaches made for swimming. The parking area soon comes into view and the narrow path becomes root bound in several areas. At 1.76 we reach the end of the loop at the wooden retaining wall. The parking area is picturesque and worth exploring. 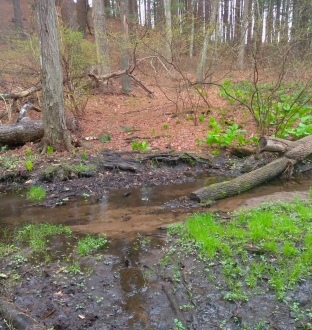 This stream runs below the main trail in. 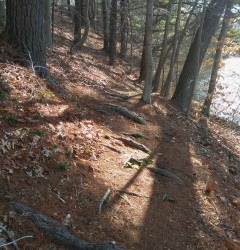 On the opposite side a trail leads away. While the map (in the right column in the trail quick facts section) shows the main trail loop, there are many smaller trails not on the map. Another few hours can easily be spent exploring these. From exit 9 in Kingston on route 3, head south on Route 3A. Follow through Kingston and into Plymouth. About a mile further Bourne St will be on the right. Follow this to the end where the somewhat rough dirt access road will lead to the right. The loop trail is just under 2 miles but many side and inner trails make for much more exploration. 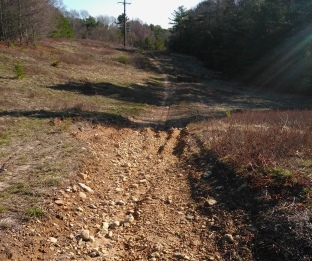 Portions of the power line section of trail are rough and steep making that more moderate. 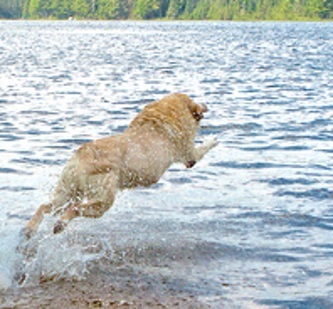 The trail side beach and stream along the inner path make good dog swim and romp places.